Lowering the speed of traffic in residential areas has become one of the most effective and economical routes to making streets safer and more pleasant for all residents from young children to the elderly and encourages more cycling and walking. It is a major factor in reducing the frequency and severity of collisions and can result in lower vehicle emissions and ease congestion, the latter making the overall journey in many cases shorter. Surveys show the implementation of 20mph speed limits has the support of more than 70% of the country's population. Recent changes in Government regulations - 'Setting Local Speed Limits - Circular 01/2013' - have made it much easier for local authorities to impliment lower speed limits. Bedford Borough Council has formally adopted the implementation of 20mph speed limits as part of its Local Transport Plan (LTP3) to promote reduced speeds in residential areas and around schools. The policy is outlined in Action 8 of the Road Safety Strategy (2011-2021) which states "Investigate and where appropriate install 20mph zones in residential areas and around schools." CCNB's campaigning stance is to support the Borough's policy and encourage them to implement it as widely as possible so that there is effectively a default 20mph speed limit not just around schools and residential areas but also the town centre and other shopping areas. Lancashire County Council in 2013 scooped a national award for a communications campaign designed to drive home the message that obeying 20mph limits in the county’s residential areas could save lives. 'Slower for a reason' was named Campaign of the Year at the Local Government Communications Reputation Awards, which are designed to recognise how effective communication with residents can help councils to deliver better services. • Carron Road area off Tyne Crescent (Implemented prior to 2008). • Tyne Crescent and all roads on either side except Ashmead Road also for St Thomas More School (Zone implemented May 2013). • Curlew Crescent and wider area (Implemented March 2015). • Mallard Hill and wider area (Implemented March 2015). • Larkway, Dove Road, Falcon Road, Fulmar Road, Pipit Rise, Merlin Gardens, The Buntings, Martin Close and Kingfisher Close (Resident's Consultation November 2016, implemented June 2018). • Dove Road and Avon Drive (South) (when lights show) for Brickhill Primary School (Implemented July 2013). • Hawk Drive and Falcon Avenue/Kestrel Way junction (when lights show) for Scott Primary School (Implemented July 2013). • Waveney Avenue (south of Dart Road and north of Starling Way) (when lights show) for Brickhill and Scott Primary Schools(Implemented August 2014). • Kimbolton Road at Avon Drive/Rowallan Drive junction (when lights show) for Brickhill Primary School (Proposal October 2018). • Alexandra Road area – Residential (Implemented prior to 2008). • Castle Road area – Residential (Planned 2012 but not implemented to date). • High Street (St Peter's Street to St Paul's Square North) - Town Centre (Zone implemented July 2013). • High Street from St Paul's Square north to its junction with The Embankment (Implemented April 2015). • St Paul's Square both north and south (Implemented April 2015). • St Mary's Street from The Embankment to Cauldwell Street (Planned 2014 but not implemented). • Duckmill Lane from the High Street to Bedesman Lane (Implemented April 2015). • Horne Lane (Proposed March 2017). • Hawkins Road, Pearcey Road and Darwin Road part - for Shackleton Primary School (Implemented January 2015). • Goldington Avenue area bounded by Caves Lane, Goldington Road and Kimbolton Road (Implemented March 2015). • Brendon Avenue, Langdale and Selsey Way (Implemented March 2015). • Church Lane part - next to shopping area and Putnoe Primary School (Implemented 2008) and extended 70m into Needlewood Road to accommodate a new zebra crossing (Proposed December 2018). • North of Goldington Road - Brookfield Road, Marshall Court, Cotswold Close, Parklands, Everard Road, Penlee Close, Heronscroft, Portland Close, Malvern Avenue and Purbeck Close. (Proposed Order October 2016, Order February 2017). • Abbey Road, Ashridge Drive, Cannock close, Ettrick Drive, Greskine Close, Glenavon Drive, Lymington Gardens, Strathconon Road, Manor Road, Harvey Road, Ouse Road, Mount Drive, Cornland and Barley Way (Proposed Order December 2018). • Stanley Street area – Residential. • Warwick Avenue, Lansdowne Road, Linden Road, Dynevor Road (Implemented 2013). • Poets area between Shakespeare Road and the railway line (Implemented April 2015). • De Pary's Avenue, Pemberley Avenue, St Andrew's Road, St Michael's Road, St Augustine's Road, St Alban Road and St Edmund Road (Proposed Order June 2018). • The Links, The Maples, The Planes, The Rowans, The Larches and the rear of Lilac Walk (Implemented 2013). • Area bounded by Bedford Road, Spring Road, Elstow Road and Bunyan Road (Consultation January 2014, Public Notice Proposal October 2014, Order February 2015, Implemented March 2015). • Southfields Estate - The Elms, The Alders, Orchard Street, The Sycamores, The Hollies, Chantry Road, Chantry Avenue, Eaton Road, Highfield Road, The Briars, The Planes, The Firs, Magnolia Close, Whitebeam Close and The Silver Birches (Public Notice Proposal November 2016, Order February 2017). • Bamford Road, Barton Road, Colling Place, Dunham Close, Goodmayes Close, Harrowden Road (access road intersecting Barford Road and Lovell Road), Leith Road, Lovell Road, Reddall Close and access roads to rear of Boteler Gardens, Welbourne Gardens and Royle Gardens. (Proposal October 2018). • Wentworth Drive part (when lights show) outside Mark Rutherford Upper School (Implemented 2008). • Polhill Avenue (South of Barnstable Road to Kimbolton Road) (when lights show) for St John Rigby and Castle Newnham Primary Schools (Implemented July 2013). • Putnoe Lane (Queens Drive to south of Stancliffe Road) (when lights show) for The Hills Academy and Hazeldene Primary School (Implemented January 2014). • Cheviot Close, Chiltern Avenue, Fairholme, Furzefield, Greenacres, Hartshill, Leasway, Mendip Crescent, Pennine Road, Pentland Road, Quantock Close, Queen's Crescent, Stancliffe Road and Woodmere (Proposed Order March 2018). • All roads (Public Notice Proposal April 2014, plan updated August 2014, Public Notice Order February 2015, Implemented February 2015). • Village Road near to Bromham Primary School (when lights show) (Implemented 2014). • Grange Lane (Public Notice Order November 2018). • Bridge End (for 412 metre spanning over Bromham Bridge) (Public Notice Proposal December 2017). • Willington Road near to Sheerhatch Primary School (ex Cople Primary School) (when lights show). • Abbeyfields on either side of roundabout next to Elstow Primary School (when lights show) (Implemented 2014). • Carlton Road (part), Church End, Grange Road, Hunts Lane (part), Marriotts Close, Memorial Lane, Pavenham Road (part), The Old Road (part), Tithe Barn, Town Lot Lane and Trinity Close (Public Notice Proposed Order December 2016). • The High Road (in addition to above) (Public Notice Proposed Order May 2017). • Barley Kiln Lane, Brook Lane, Church Walk, Dove Lane, Priory Close, Roman Paddock, Saxon House, The Green and High Street (C26) from No 13 in a westerly direction to 13.5m east of its junction with Orchard Close (Public Notice Proposed Order November 2015). • Eagle Way, Mansion Lane, Orchard Lane, Dickens Close, Wood Road (part) and High Street (Public Notice Proposed Order November 2016, Public Notice Order January 2017). • High Street from unnamed road (C4) to 18m west of 'Walnut Cottage' High Street (Public Notice Proposed Order May 2015, Order June 2015). • High Street existing limit extended for 55 metres in a north westerly direction (Public Notice Proposed Order November 2015). • Woburn Road near Church End Primary School (when lights show) (Implemented 2014). • The whole of the area west and east of the new A600 (Implemented 2012). • Gold Street, Church Lane and Kings Close (Implemented 2013). • Moor End Road from Felmersham Road to Moor End Lane (Implementated June 2014). • High Street, Church Lane and Park Lane (Implemented 2013). • The whole of the area west of the old A600 and the area between the old and new A600 (Implemented 2012). • Park Crescent next to Broadmead Primary School (when lights show) (Implemented 2014). • The Crescent for Marston Vale Middle School (when lights show) (Implemented 2014). • The Crescent and Wavell Close (between Stewart Way and The Crescent) (Proposed Order March 2018). • High Street next to Wilden Primary School (when lights show) (Implemented 2014). • Shay Lane, Brook Lane and Shelton Road from Brook Lane/Shay Lane junction for 73m in north west direction (Public Notice Proposed Order May 2015, Order June 2015). • High Street for 201 metres outside Eileen Wade Primary School (Public Notice Proposed Order November 2015). • Bedford Road near Wootton Primary School (when lights show) (Implemented 2014). 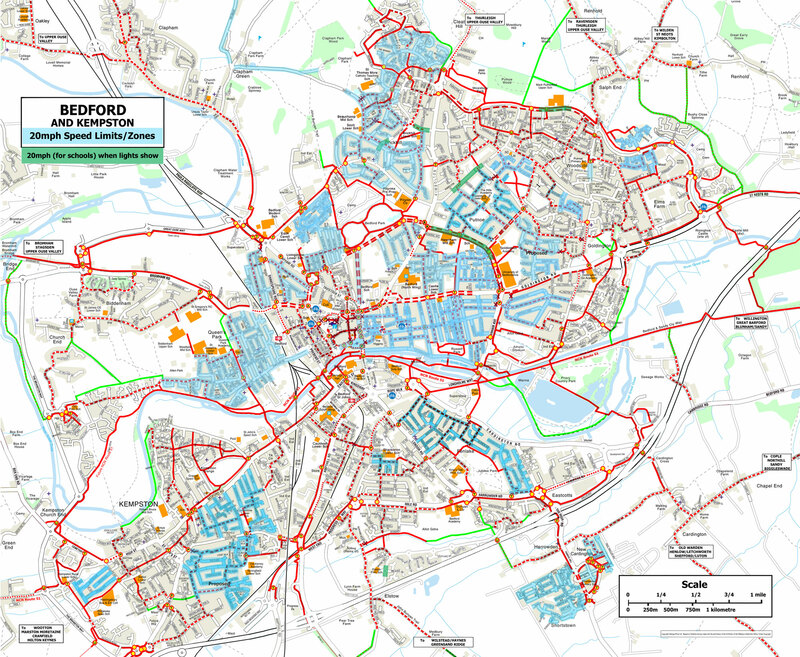 A map of where 20mph speed limits/zones are in the Bedford/Kempston urban area can be seen here. A 20mph zone is usually a short section such as outside a school with the speed enforced by traffic calming. A 20mph speed limit normally covers a number of roads or even a whole town or city and the speed is enforced only with signs and very little traffic calming. 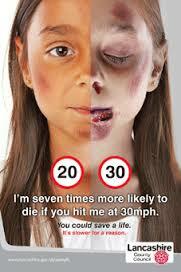 ACPO* released its updated guidance on the enforcement of 20mph speed limits in October 2013. The guidance states that targeted enforcement will take place in all 20mph zones and speed limits where there is evidence of deliberate offending or disregard of the speed limit. Routine enforcement, or regular planned attendance, will take place in clearly posted zones where there is no evidence of deliberate offending or disregard. Marking a new approach, drivers who drive between 24 and 31mph in a 20mph zone will be sent on a specially designed speed awareness course. When education is not appropriate (e.g. if the driver in question has already completed the course within the previous three years), they will be ordered to pay a fixed penalty notice of £100 and receive 3 penalty points. The speed at which drivers may face prosecution has dropped from 40mph to 35mph. * Since 1 April 2015 the ACPO is now known as the National Police Chiefs Council (NPCC). 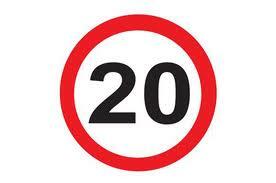 For further extensive information on 20mph speed limits visit 20's Plenty for US and for their September 2015 report on the subject Brake - the road safety charity and their key Fact webpage. A more recent road safety factsheet on 20mph zones and speed limits has been published by ROSPA - The Royal Society for the Prevention of Accidents.